You can make your calzones with a variety of fillings. These freeze well so it is a great idea to make a large batch for another night. 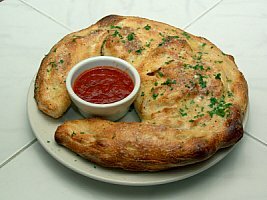 We have several calzone combinations to try. Dissolve yeast in warm water and add a dash of sugar. Meanwhile, in mixing bowl add flour, salt, oil and Italian seasoning. When yeast is bubbly and ready pour into flour mixture and blend. Form into a ball and place in a oiled bowl. Let rise 30-60 minutes. Separate dough into desired number of calzones. Roll each ball of dough into a circle. Prepare your calzone dough by follow directions above. Top half of each calzone circle with desired toppings. 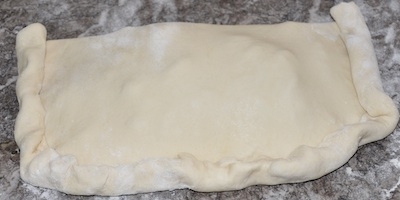 Fold over dough and roll edges together. Pinch seams together. In a large measuring cup add oil, basil and Parmesan cheese together. Whisk until blended. With a pastry brush, brush the top of each calzone. Bake at 450 degrees for 10-15 minutes. Top calzone with ham and cheese and sprinkle with parmesan and basil. You can also substitute cheddar cheese for the mozzarella. Saute spinach in a frying pan and drain well. Mix ingredients together and lay on top of your calzone(s). Follow directions on how to make your calzone. spinach, shredded cheese, cooked chopped broccoli, diced tomatoes or pesto. My favorite chicken combo is chicken, broccoli and cheddar cheese. Sprinkle calzone dough with chopped cooked chicken, steamed chopped broccoli and sprinkle with cheddar cheese. Season with Italian seasoning or Basil and seal edges. In a bowl, mix cheeses and seasonings. Add to rolled calzone dough and seal edges. 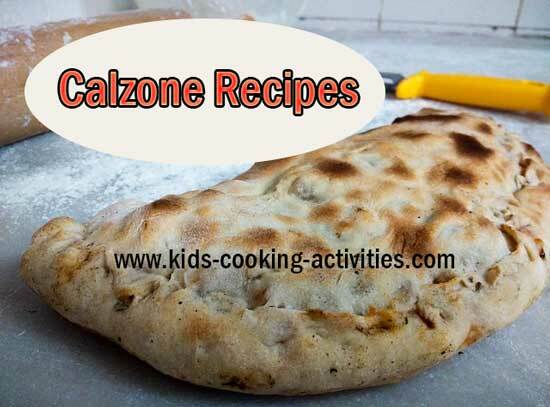 Try a calzone kids cooking party! See more filling ideas and variations on our Individual meat pies page.